We marked the beginning of the New Year by continuing the purge of our belongings, as well as retiring those things that we no longer use to the basement. Included among these items was SJ's crib, as she graduated to a 'big girl's bed' some 8 months ago. Now, in our defense, we were in Germany for 6 of those - so we have a good excuse for not getting around to this sooner. But, it was time. So that's who's been using up all my minutes! One of the most startling things about returning to the U.S. has been the amount to "stuff" we have in our place. After living out of suitcases for 6 months, is quite a culture shock to come back to a house filled with stuff that we didn't touch for half a year (and probably much longer than that). So, we decided it was time to take a thorough inventory and get rid of stuff. As a native New Englander, however, SJ is loathe to get rid of anything. So, everything we pulled out to donate to charity, SJ decided was her new favorite toy. 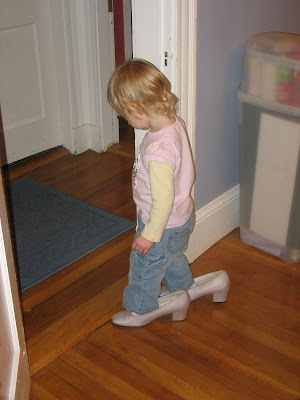 Amazingly, SJ was actually pretty good at walking around in a pair of her father's shoes. 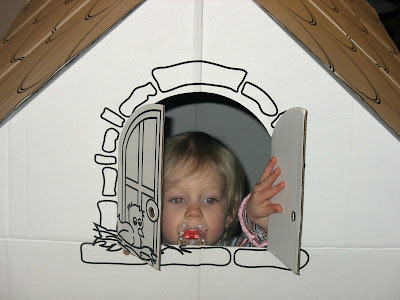 SJ's Aunty Em gave her a cardboard playhouse for Christmas, and SJ decided that today was a good day to get it out and play with it. Although it takes up our entire living room, thankfully it folds down to a much smaller size. By the afternoon, SJ was feeling considerably better. She is still pretty tired as a result of lousy sleep patterns for the past few days, but she's a much more chipper little toddler. She took her new bike for a few laps around the playground. She's getting to be pretty good at it. Unfortunately for SJ, her 'Christmas Flu' has continued even after the presents have all been opened. Her recipe for recuperation is one part Little Einsteins videos, one part tea parties, and extra time with her paci. 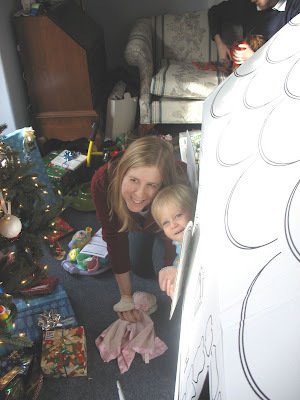 While this was SJ's third Christmas, it was a very special one, since she was able to appreciate everything much more than when she was younger. 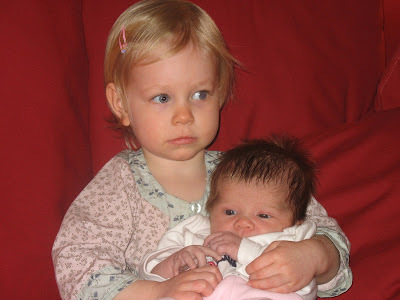 Unfortunately for SJ, she woke up on Christmas morning with a fever - so she wasn't feeling her best. 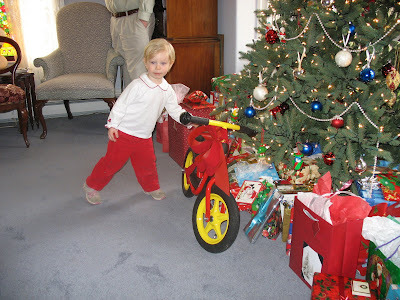 When we were in Germany, we saw many kids SJ's age with training bikes without pedals. The kids can sit on the bike and run or walk with them, and they are a great way for them to learn how to ride a bike without training wheels. We thought about bringing one back from Germany, but SJ's mom contacted the company and found the contact information for the U.S. distributor - so we were able to order a bike for SJ on-line. This was a welcome relief, as we didn't want to have to deal with another piece of luggage on our return journey. Thankfully, the bike was a huge hit with SJ. 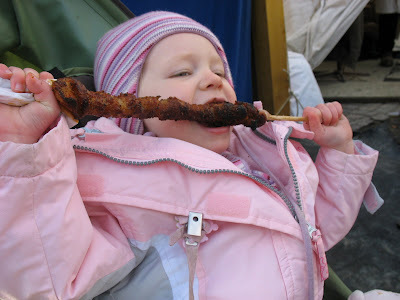 She could barely put it down the whole day. It is just a little bit too big for her, but we bought it with the plan that she would use it more this summer than right now - although currently it is around 50 degrees outside. 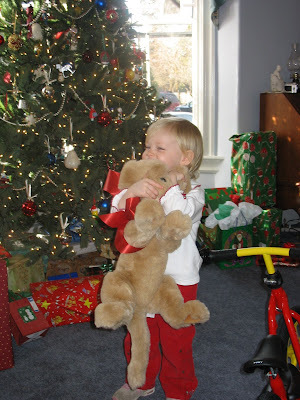 It was a very nice Christmas, as all of one side of SJ's family was able to be home for Christmas. She got a lot of really nice presents, including a little tea set that was also a huge hit. SJ had a lot of fun throughout the day serving tea. Whenever someone said they didn't want any tea, SJ would say "Okay, coffee?" It was pretty funny. 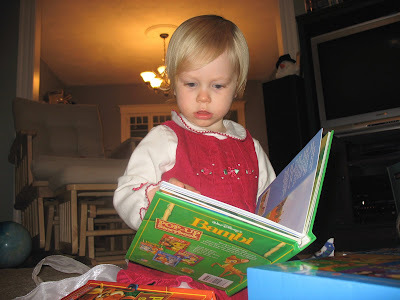 ... and a new set of pajamas from her Uncle Ben and Aunt Ruthie. She really liked the pajamas because they had rubber duckies on them. This morning we all got up and went to SJ's grandfather's church up in New Hampshire. SJ enjoyed the Christmas Carols quite a bit. 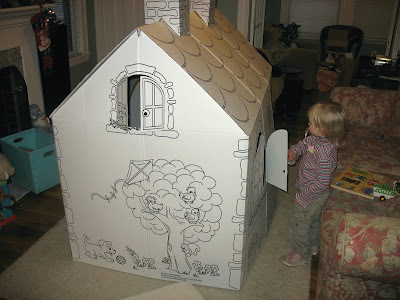 Afterwards, we went back to SJ's Gami and Papi's house for some Domino's Pizza with her Aunty Em. Good pizza was something we were really craving in Germany. Although we traditionally open our presents on Christmas, we typically open one or two on Christmas Eve - just to spread it out a bit. So, after our return home SJ opened a few presents. Thank you Wilkes! I guess I should say a few words about our return trip. We got up around 5:30 in the morning, as we had to finish up a little bit of packing, take out our last load of trash carefully sorted into 3 different trash bins, and haul all of our belongings down 40 flights of stairs to the street. Okay, it wasn't quite 40 flights, but it sure felt like it - especially when carrying a 50 lb suitcase in each hand. At least it was 'downhill' this time. Our taxi cab arrived on time, thanks to our friend, Nicole, who offered to call the taxi service. 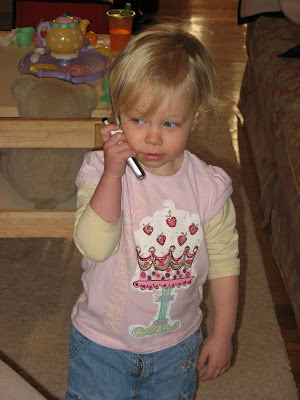 I find speaking German over the phone to be very intimidating, and I didn't want to take any chances with the taxi. So, it was very helpful to have a native call for us. We arrived at the airport about 2 hours and 15 minutes before our flight, but we barely had a minute to spare. Checking in went reasonably quickly, but getting through security took quite awhile. 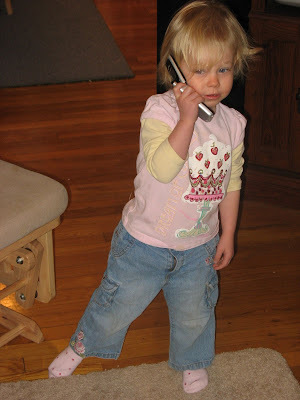 On the plus side, EU security is now the same as U.S. security, so you don't have to go through security twice on flights to the U.S. On the downside, SJ hadn't slept well in the past few days and had to get up early, so she wasn't the most easygoing toddler. SJ's uncooperative mood continued for the first few hours on the plane, but then she fell asleep for a pretty good nap. When she awoke, she was an entirely new kid. She had a good time hanging out in her seat, reading the inflight shopping magazine, and walking up and down the aisles. 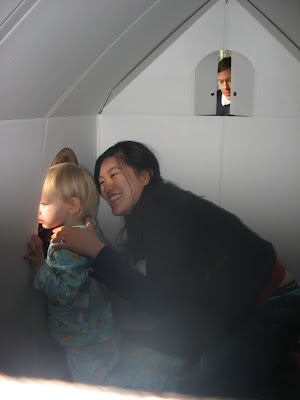 About midway through the flight, she met a 5 year old boy on the plane and they had great fun together. SJ kept referring to him as "Boy", which was very unintentionally funny. "Boy, come here" or "Where did you go, Boy?" Around 9 hours after taking off from Cologne, we landed in Newark. Unfortunately, you have to load up all your bags, go through customs, and then re-check your bags. Thankfully, as we wheeled our luggage cart with 6 bags stacked on top of it (we looked like a giant size Jenga game) U.S. Customs decided that we deserved a 'wave through' inspection. After re-checking our bags, we unfortunately had to go through security again - as Newark doesn't have secure transport from Terminal C to A (although they do the other way - go figure). So, after about an hour and a half of lugging suitcases, unpacking laptop bags, riding airtrains, etc., we made it to our final leg of the journey. Our last weekend in Bonn was a pretty poignant one. It's hard to believe that just a few months ago we were literally counting the days until we left, and in the end we were really torn up about leaving. In many ways, the weekend was a great last 'hurrah' as we went to the end of the year party put on by my company, enjoyed a few last trips to the Christmas market, and SJ also got the chance to spend most of the day with her good friend Jona. However, while on the surface the weekend would seem to be good closure, all it really did was make sure the emotional floodgates were good and open while we packed up our belongings and got ready for the journey back to Boston. If only we could have arranged some more 95 degree weather and a few more trips to the immigration office, then we could have returned to Boston with a real bounce in our step. Instead, we felt torn in two - excited to see family and friends and familiar surroundings again, but mournful of leaving the same behind. It was a day that began at 5:30 a.m. Bonn time (11:30 p.m. EST the day before) and didn't end until around 2:00 a.m. Bonn time (8:00 p.m. EST), but we are home. All of our bags made it through, and all of our selves made it here as well. It's hard to believe it has come to this, but tomorrow we leave for the U.S. We packed and re-packed and packed our bags again, and we now have 6 bags that all fit (just barely) under the 22 kg/50 lb weight limit. In addition, we have 2 laptop bags, a rollerboard carry-on, a diaper bag, a stroller, and of course, SJ. We'll be touching down in Newark around 1:20 p.m. in the afternoon, and then we catch a 3:30 flight to Boston. It's going to be one heck of a long day, as we'll be getting up tomorrow at 5:45 a.m. local time, and probably arriving at home around 6 or 7 EST (midnight to 1 a.m. German time). 10) Having tax and tip already included in the bill : One of the nice things about purchasing things here is that the price is the price. The Value Added Tax is already included, and tipping is much less extensive than the U.S. (usually rounding up to the nearest Euro, or 10% maximum). 9) Not having a lot of "stuff" to worry about and clean up : Since we were 'only' able to bring 6 suitcases over for our 6 month odyssey, we didn't have a lot of extra "stuff". So, we were able to avoid the plague of clutter. 8) 60 cent ice cream cones : During the month of July, when the thermometer was regularly in the 90's, the ice cream place near our house with 60 cent ice cream cones was a near daily visit. 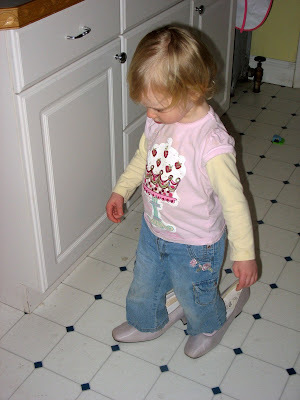 7) Having a nice playground with kids nearby : We do have a reasonably nice playground near our house in Boston, but there are rarely any kids SJ's age around, and even rarer are there parents around. 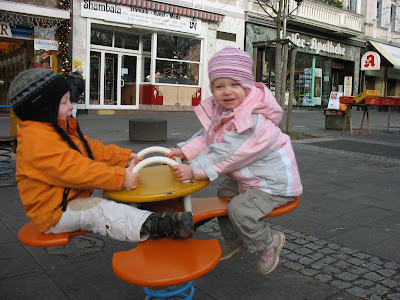 The playground here in Bonn was a good place for SJ to play with other kids her age, as well as for her parents to interact with other parents. 6) The "Smalltown USA" feel : While it is very counterintuitive, manytimes Bonn felt like the kind of small towns you see depicted on television and the movies. They often had hokey little festivals on the weekends with bands that were clearly thrown together from all over the age spectrum, but it was fun. We half expected to see Taylor from the Gilmore Girls walking around selling cotton candy. 5) Sunday morning trips to Mr. Baker : One of the few places open on Sunday, we would walk to the dead quiet pedestrian zones on Sunday morning to allow SJ to run around as well as enjoy sitting in an outdoor cafe, enjoying a pastry and a latte macchiato. 4) New foods : While there were certainly lots of foods that we missed in the U.S., there were a lot of new things that we really enjoying trying and (for the most part) enjoying here in Europe. 3) Really relaxing weekends : On those weekends where we didn't go somewhere, the time was incredibly peaceful and relaxing. Since the stores aren't open, you don't spend your Sunday running errands. Since we also had a smaller place with less stuff, we didn't have to spend nearly as much time working around the house on weekends. 2) Weekend adventures : Being so close to the train station made it very easy for us to go lots of interesting places on the weekends. While all the travelling was tiring at times, we really enjoyed getting to see so much during our time here. We also really enjoyed being able to have something to do on the weekend that was worth looking forward to. 1) Our new and old friends in Bonn : There have been many people who have rotated through Boston and then returned to Bonn, so in coming to Bonn we already had a number of friends to become reacquainted with. We also had a chance to make new friends, from work, or the playground, or the English language playgroup that SJ took part in. 10) Store Hours : No stores open on Sundays and no stores open after 8 p.m. Many places close before 6 p.m. I don't know how people get any shopping done. 9) Language Barrier : We know a tiny bit of German, and in our experience about 50% of people speak at least some English. However, there are still plenty of opportunities where someone needs to explain something complicated and no one can really understand each other. 8) German Television : For some reason, really bad American television is dubbed in German and then re-broadcast on German television. While some of the hit shows in America like Lost and Desperate Housewives are also on here (about one year delayed) for some reason they bypass all the 2nd tier programs, and go straight for the bottom of the barrell - "Beauty and the Nerd", "The Nanny", "Sledgehammer", etc. 7) A "Nickle and Dime" consumer culture : We have found Germans themselves to be very generous people. However, the consumer culture is definitely not generous. This is not the "Land of the free gift with purchase". You are expected to pay for restrooms. There are no free refills on anything. Ketchup costs money. Dipping sauce for your McNuggets costs money. You very rarely get a napkin when you order something. You have to buy plastic bags at the grocery store, and some big department stores don't actually have bags at all. 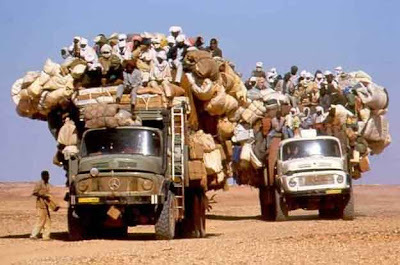 6) Not being able to drive anywhere : While travelling on the train or public transportation is usually pretty convenient (although not always cheap), there are many times when it is really a pain. If you are going to a popular destination, everything is fine. But if you need or want to go somewhere that isn't a major hub, you'll often find that you have to make several train changes and be stuck with once an hour service that takes forever to get somewhere that is less than 20 miles away. 5) Grocery Stores : This is somewhat of a blend of the language barrier and the store hours issue, but this deserves it's own ranking. There are larger grocery stores around, but the one near us was pretty small, with narrow aisles and long lines (especially after work). They also don't seem to stock many of the items after a certain point in the day, so it was not uncommon to go the grocery store after work and find that they no longer had any meat for sale, for example. There was also the general issue of trying to figure out exactly what things were. "Is this fabric softener, or is this laundry detergent?" 4) No air conditioning : It's extremely rare to find air conditioning in Germany. Not in office buildings, not in grocery stores, restaurants, etc. and certainly not in apartments. So, when it's really hot outside, there is really nowhere to run to escape the heat. 3) German Bedding : I guess people feel comfortable with what they are used to, but German beds are much different than the U.S. The pillows are about twice the size of American pillows, but about 1/3 the volume. So, you end up with this huge, incredibly limp, pillow. They also don't have large comforters like the U.S., so you really have to be careful to keep yourself under the blankets in the colder months. In the summer, they don't have top sheets on the beds. So, your choices are either to sleep under nothing (which feels very odd to us) or sleep under your comforter (which is incredibly hot). Mattresses in Germany are also about 20% as thick as U.S. mattresses, so the overall sleeping experience takes some getting used to. 2) Cigarette Smoke : It's amazing how many more people smoke in Germany than in the U.S., and it's also amazing how irritating that is to people who are not used to cigarette smoke, such as ourselves. In the summer it wasn't as bad, since a lot of restaurants have seating outside - but once it gets too cold to sit outside the smoking is really bothersome. 1) Not being near our friends and family : While we were very blessed to have lots of visitors during our stay in Germany, we still miss our families and our friends back in Boston. 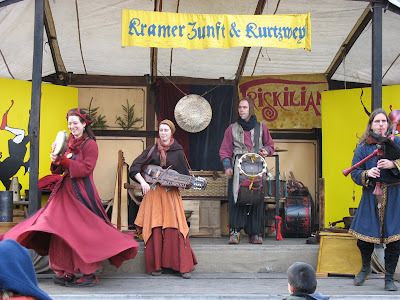 While we have certainly enjoyed the Bonn Christmas market, for a change of pace we went to the nearby Siegburg Christmas market - which has a medieval theme. 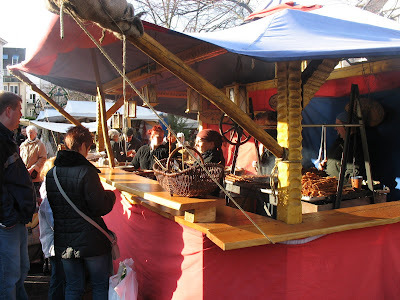 We were not disappointed, as the Christmas market in Siegburg is filled with medieval musicians, artisans, and food. The vendors all supposedly speak in medieval German - but I couldn't tell. That is, I couldn't understand anything they were saying - but I also can't understand anyone at the post-office, either. Hmm...maybe the post-office in Bonn is supposed to be a medieval post-office. That would certainly explain some things. 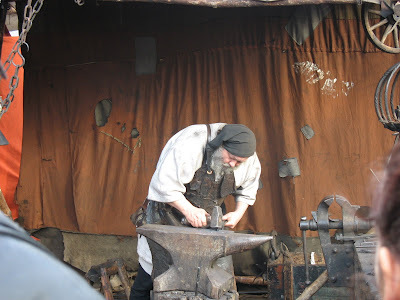 One of the neat things about the Christmas market in Siegburg is that many of the vendors make their wares right there on site. So you can see people knitting - okay watching knitting is not exciting - but there are blacksmiths, and bakers making bread in wood-fired ovens right there in the market. They also had lots of interesting food as well. We enjoyed some delicious spaetzle - which is the medieval equivalent of macaroni and cheese, as well as some kind of meat on a stick. Hmmm...medieval corn dogs! 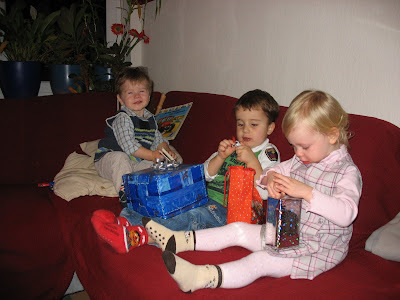 December 6th is St. Nicholas Day in Germany, when St. Nicholas comes and gives the children a small present. 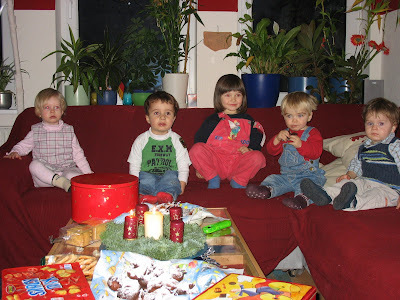 Lucky for us, some friends from the playground invited us over to share in this German tradition. On St. Nicholas Day you first put out a plate full of cookies and some veggies for the reindeer, and then they gather all the kids together to wait for St. Nicholas. 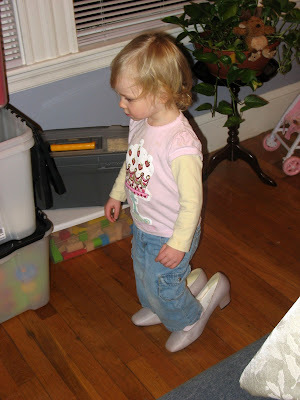 We tried to prepare SJ for St. Nicholas by coaching her for a full day that St. Nicholas was coming, and that she didn't need to be afraid of him. But, unfortunately, it was of little use. SJ was terrified of St. Nicholas - and did her usual "If I look away and pretend I don't see him, maybe he won't see me" routine. When St. Nicholas comes, he reads from his list and tells the children what they've been good at from the previous year, and what they need to work on for the coming year. I thought that was an interesting tradition, and I am going to suggest for my next year end performance review that the partner wear a St. Nicholas suit - it makes the whole thing more fun. 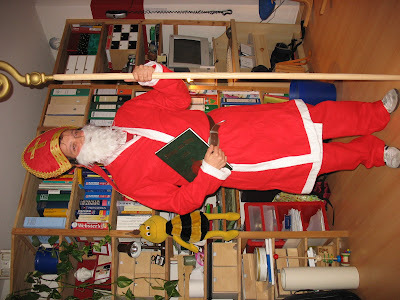 After St. Nicholas reads over the list of plusses and minuses, he gives the children each a small present. Kind of like the year-end bonus. Afterwards, we were invited to stay for dinner and a challenging game of Settlers of Catan. I don't think we've played since SJ was born, so it was great to play again. 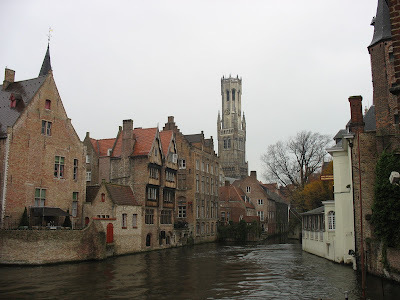 We spent two nights in Brugge, which is really an incredibly preserved town in Belgium. While it is a bit crowded with tourists, it's with good reason. 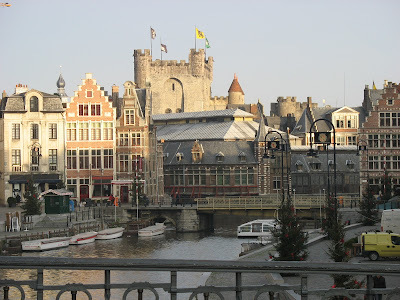 The architecture is beautiful, the town is easy to get around on foot, and there is plenty to see and experience. 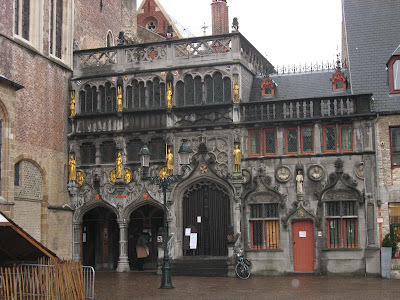 In terms of tourist attractions, the town has a belfry tower (Belgians seem to love bells almost as much as waffles), as well as the Church of the Holy Blood - a small medieval cathedral that holds a cloth stained with the blood of Christ from the Cross. 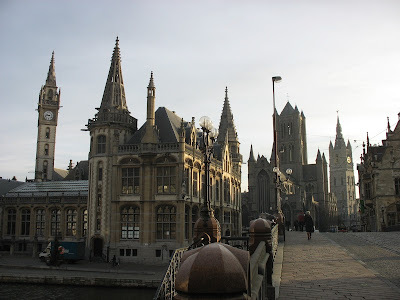 There is also the Church of Our Lady, which I believe is the tallest cathedral in Europe. Aside from its height, it's a somewhat unimpressive cathedral - although it does hold a statue by Michelangelo, one of the few outside of Italy and the only one that left Italy during this lifetime. 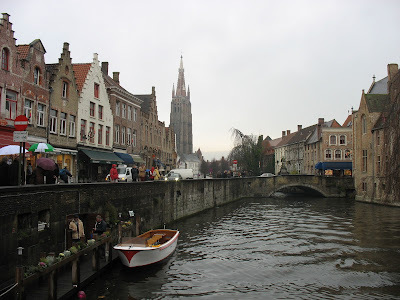 Like much of Belgium and the Netherlands, Brugge has a system of canals going through much of the city. 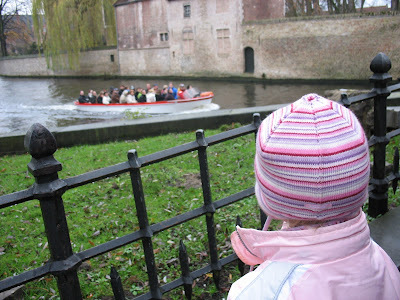 So, even though the weather wasn't too great, we took a 30 minute boat tour through the canals. SJ had quite a bit of fun with that. 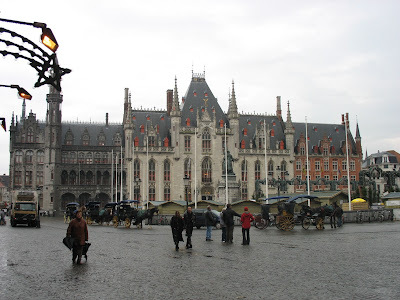 We awoke the next morning in Ghent, which is a very charming Gothic town in Belgium. We took the streetcar from our hotel into the center of town to take in the sights. 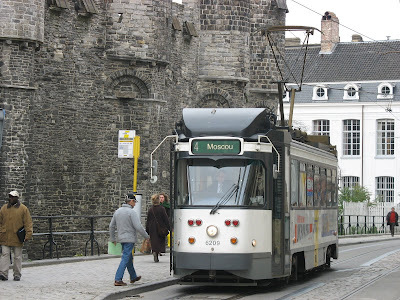 Ghent's main tourist attractions are the Belfry Tower, St. Bavo's Cathedral, and Castle Gravensteen. Unfortunately, the Belfry is closed in the winter - as I am sure it affords a great view of the city. St. Bavo's Cathedral was really quite stunning. 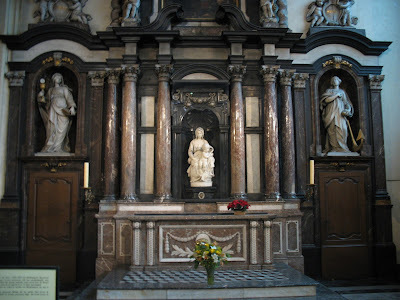 It is one of the nicest and well preserved cathedrals we have seen in Europe. When we visited, we were also treated to an impromptu organ recital. It was absolutely amazing. The organ is spread throughout much of the cathedral, so the music comes at you from all angles. It's like THX, but from hundreds of years ago. 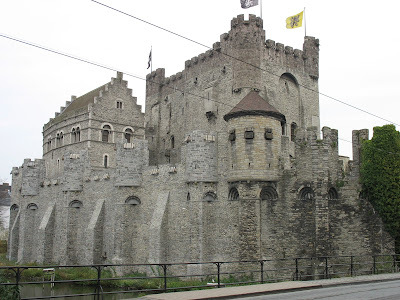 Castle Gravensteen is also quite a treat, as it really looks like the kind of medieval castle you see in movies and story books, etc. 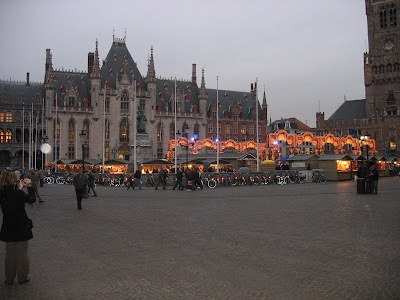 After spending the day in Ghent, we took another short train ride further West to Brugge. We arrived in the evening, so we had a bit of time to head into the center of town and check out the action. They had set up a large skating rink in the market square that was surrounded by the Christmas market. All of it was decorated with lights, which made for a really beautiful setting. 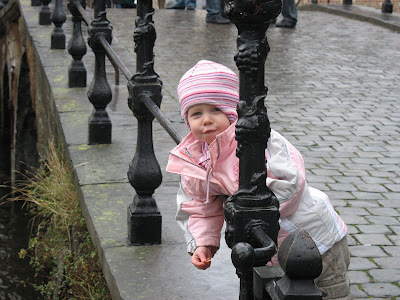 The only downside was that it was a bit chilly and damp, so we couldn't spend too much time outside.